Design Greeting card using Greeting Card Maker Software. Generate different types of greeting cards to gift others without need to purchase from store. Easy software working wizard provides simplified steps to create greeting cards with photo addition capability to give your designed card a trendy look. 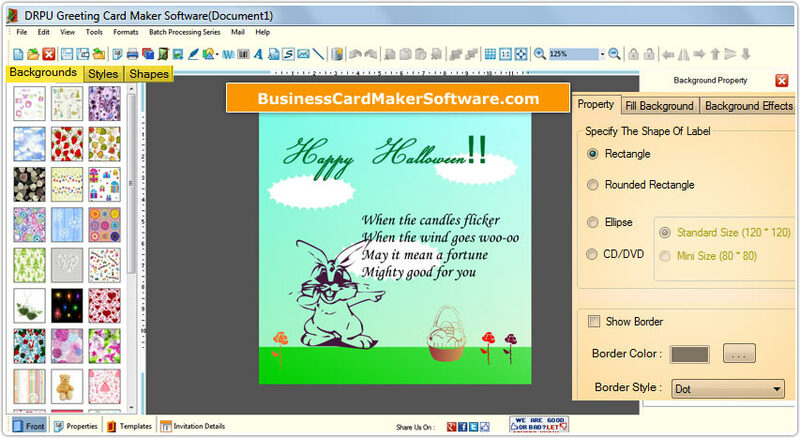 Greeting card maker software provides option to start with new Greeting Card format or edit existing Greeting Card format. Also easily create Greeting Card using wizard or with blank format with option to save designed greeting card for any future modification if required. ✔ Powerful image designing capabilities to design great looking greeting cards. ✔ Provides advanced greeting card designing and printing facility. ✔ Design and create Greeting Cards using image designing tools including Line, Ellipse, Pencil, Rectangle, Text, Picture, Arc, Triangle and Star objects. ✔ Option to fold designed Greeting Card (to design folded greeting card). ✔ Add WordArt text-styling feature to the Greeting Card. ✔ Design and create Greeting Card in Rectangle, Rounded Rectangle, Ellipse or CD/DVD label shape. ✔ Specify the color and background settings of Greeting Card including Solid Color, Gradient, Image and Style settings. ✔ Include message using message templates (available with the software) during Greeting Card designing process. ✔ Select image from library during Greeting Card designing process. ✔ Data Set Series feature allows to generate the multiple copies of Greeting Card with different text value. ✔ Option to print created Greeting Card using advance print settings.